What exactly was "smug, self-righteous" about Mo'Nique's speech? Mo'Nique is a large, dark-skinned Black woman -- one of the most vilified images in this country for centuries -- and that she won an Oscar for a supporting role (only the 3rd Black woman to do so in 82 years) is astounding, even with her other awards leading up to last night, because Oscars are known to flip the script (such as Geoffrey Fletcher beating Jason Reitman). That she also won for a role that made quite a few in the Black community cringe was even more astounding. 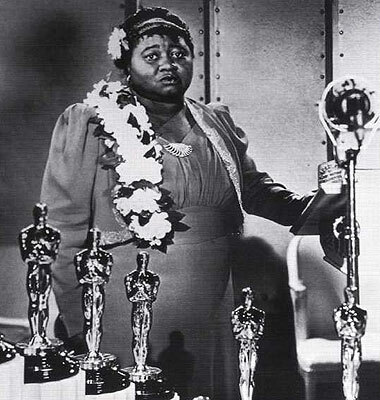 Her respect and knowledge of cultural history regarding her Oscar was such that she not only made reference to Hattie McDaniel as "Mammy" (for many, another cringe-inducing role) but that even her style dress and flower was reminiscent of first Black Academy Awards-winner, Hattie's attire on her Oscar night. For me, her tone was on point; her reference to her husband convincing her to take a role that was not popular (and it so wasn't) was truthful; her giving love to fellow cast members/"Precious" family was correct; her acknowledging Oprah's and Tyler's roles in the movie's visibility was absolutely true; and her shout-outs to reps, etc. was standard acceptance speech fare.